With a great deal of collaboration, strategic thinking, and enthusiastic support from students, faculty, and staff, Kathia Benitez and her team at Northwestern University created sustainNU, a university-wide program that aims to engage students, faculty, and staff in reducing and eventually eliminating Northwestern’s contribution to climate change. Benitez has always been interested in understanding human behavior. Her first master’s degree is in behavioral health, which allowed her to explore issues of how people interact with the environment. Throughout her career, Benitez has applied her understanding of human behavior to her leadership style. 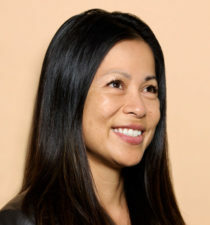 In her roles as supervisor of plant operations and later as corporate energy program manager at New York Presbyterian Hospital, she was able to develop productive relationships with staff and shift the culture to create a safe environment that allowed for inclusivity, transparency, and shared ownership of successes and improvement opportunities. As senior manager for market transformation at JDM Associates, she developed a team that implemented the Better Buildings Initiative for the US Department of Energy. Using the same leadership skills, she cultivated a team that went on to build connections with partner organizations from several sectors. The team was able to foster a spirit of collaboration, learning, and idea-sharing to achieve program goals and support the overarching mission of reducing greenhouse gas emissions and protecting the environment. In June 2016, Benitez joined Northwestern University as its sustainability director. She spent the first year working to develop Northwestern’s first-ever strategic sustainability plan. She and the sustainNU team facilitated the efforts of sustainNU Working Groups to develop this five-year plan. Benitez, along with her colleagues Julie Cahillane, Audrey Steinbach, Stephanie Folk, and Andrew Stein, sat down for a roundtable interview with American Builders Quarterly about developing sustainNU, putting it into practice, and their hopes for the future of sustainability at Northwestern. What were your priorities as you started to develop a strategic sustainability plan for Northwestern? Kathia Benitez: Since this is Northwestern’s first strategic sustainability plan, it needed to be thoughtfully structured and aspirational. We convened stakeholders from throughout the university to identify best-in-class programs that would encourage innovative solutions from our world-class research institution. This plan would not only change our university but would lay a foundation that other schools could build on. What did all of your research lead you to? How did you develop the basics of the Strategic Sustainability Plan? KB: The Strategic Sustainability Plan sets the framework for a range of action plans targeting five key program areas. These areas are the built environment, transportation, resource conservation, experiential learning, and communication and engagement. Each program incorporates key focus areas with measurable objectives. The Strategic Sustainability Plan is complemented by an implementation road map that details how the goals of each program will be met, and how the university’s success will be measured. Can you give us an overview of those five pillars? What do they involve? KB: For the built environment program, our mission is to improve the built environment at Northwestern so that we lessen our harm to the environment and reduce greenhouse gas emissions. Our key focus areas are enhancing energy and water efficiency in existing buildings and grounds, renewable energy use, sustainability in new construction and building renovations, and greenhouse gas emissions. The transportation program’s vision is to reduce the environmental impact of student, faculty, staff, and visitor travel by providing safe, environmentally efficient modes of transportation and the required support infrastructure. Our key focus areas address public transportation use, pedestrian and bike-friendly roads and walkways, and providing resources and facilities supporting bicycle and electric vehicle use. The resource conservation program vision is to adopt sustainable procurement practices for materials, food, and services and take a comprehensive approach to conserving resources and reducing and managing waste. 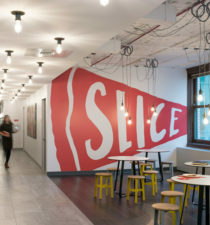 Our key focus areas are waste reduction and landfill diversion; reuse, recycling, and composting; sustainable procurement practices; and food sources and partnerships with food service providers. The experiential learning program vision is to support hands-on experiential learning at Northwestern that enables students to engage with the physical environment, address global environmental issues, and grow as leaders in sustainability. Finally, the vision of the communications and engagement program is to foster a university-wide culture of sustainability and environmental stewardship. 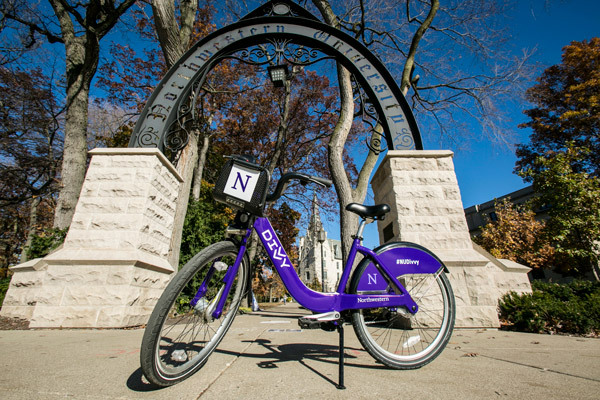 Students, faculty, and staff receive discounted Divvy bike-sharing memberships, making sustainable transportation around campus more affordable. You are a small team taking on a big task at an even bigger university. How have you worked together so successfully? Julie Cahillane: Our team embodies the meaning of collaboration. There is an all-for-one attitude of support for getting things done. While we all have areas of focus, everyone pitches in and shares responsibilities when needed. The dedication and enthusiasm are empowering. Audrey M. Steinbach: We all have a real passion for sustainability and want to succeed in everything we do, and sometimes this means climbing into a dumpster to grab a box that needs recycling. Andrew B. Stein: The implementation road map is a guiding force that helps us break down our goals into sizable tasks. 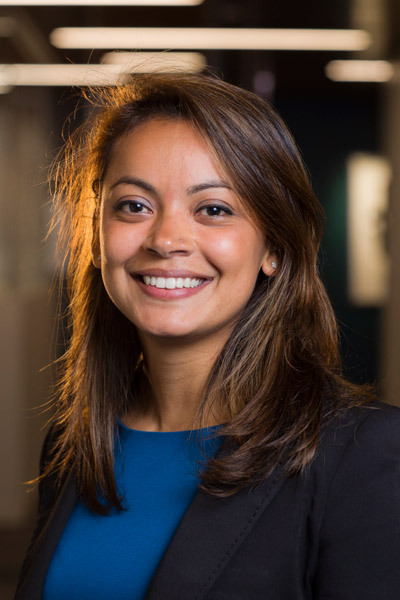 Kathia’s leadership has been a driving force behind the plan that we are all very proud of. How did you generate buy-in on campus? JC: Anything of the scope of our strategic sustainability project takes time. There were many steps to come to a consensus on the objectives and gain approval from all relevant parties. Our team has both flexibility and patience, which helped maintain focus. KB: We started transforming the Office of Sustainability by rebranding our efforts as a program, sustainNU, which created an inclusive approach that allows the entire campus community to get involved and support any of those program areas. When developing the implementation road map, we identified key stakeholders who would be instrumental in creating and implementing policies and guidelines that would support the program objectives. We involved them in the process early on so that they would have a sense of ownership and buy-in from the beginning. We also created working groups that include faculty, students, and staff. These groups support the objectives of each of these programs. Stephanie Folk: Collaboration with other groups within the university has been a critical focus. We have developed partnerships with departments such as the Institute for Sustainability and Energy at Northwestern, Global Marketing, Human Resources, Procurement and Payment Services, Government Affairs, and Neighborhood and Community Relations to help spread the word about our sustainability efforts on campus and in our broader community. 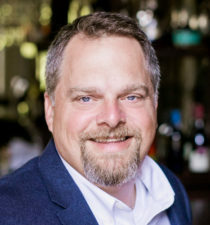 We work together to connect with people through social media, websites, newsletters, and in-person events. We also support student organizations that focus on sustainability. We hold regular meetings and mixers where students from different groups can get together to talk about their goals, interact with sustainNU staff, and find ways to collaborate and increase their impact. What has the response been like among Northwestern’s faculty, students, and staff? JC: Having been with Northwestern for more than 20 years, I’ve seen the institution evolve from wanting to do the right thing to fully embracing the concept of sustainability. There has been a substantial culture shift on campus. AMS: Students, faculty, and staff have been ecstatic about getting involved in the program and getting involved at any level with the program, whether that means volunteering for a single event during Earth Month or leading a Working Group for a two-year term. We are getting questions from people on campus about how they can get more involved in the program, and seeing that has been extremely encouraging. KB: Just the other day, I got a call from the Women’s Center. They’re doing a lot of work around social justice issues and diversity and inclusion, so my colleague wanted to talk about how those efforts have an alignment with what we’re doing within sustainNU. Even though diversity and inclusion is separate from sustainNU, there’s still a touchpoint. When you look to the future of sustainNU and sustainability at Northwestern in general, what do you see? KB: My vision and hope for sustainNU is that it continues to find opportunities to connect with other areas of the institution to undergo a complete transformation, incorporating sustainability at every level. It’s exciting to see how other departments are weaving in sustainability as part of their operations. It’s exciting to attend other departmental meetings and hear an executive director or a vice president talk about sustainability as a priority. They’re weaving sustainability into their plans, and that’s happening throughout our culture. It’s transformational. Congratulations to Northwestern University. Centric Energy Systems builds systems to provide understanding of energy systems operation. Our systems are designed to help clients see how operating decisions affect energy consumption. It has been our privilege to help Northwestern see energy consumption and operating conditions since 2002. Lucid’s BuildingOS platform reveals insights for operations & maintenance, sustainability, and finance teams to make better, data-driven decisions about commercial building operations. Over 500 customers, managing 1.5 billion square feet, achieve new levels of portfolio efficiency and performance across cost control, compliance reporting, occupant satisfaction, and equity value with BuildingOS. Email sales@luciddg.com to learn more.